Hello Friends! Today’s blog, brought to you by Eureka Crystal Beads, is about inspiring your bead selection with DEEP SUMMER COLOR PALETTES! While often Summer can make us think of bright fun colors often seen on beach towels (think Turquoise, Coral, Lime Green, & Hot Pink! ), these colors tend to remind me of early summer. But, as we are now smack dab in the middle of August and approaching the tail-end of the Summer season, my thoughts turn to those of deeper (yet still vibrant and intense) color schemes, such as Jewel Tones… Want to see what I mean? Check out some of my favorites! I’ve always been a fan of all of these colors, especially those bright and deep teals on the far left and even that sassy mustard on the far right! The reason I’m featuring these particular jewel tones above is that not only would they look spectacular all combined together in the same project but you can also pull any 2 or 3 of them out and combine them together for a palette that’s either subtle or full of pop! Consider a project using both the light and deep teal at the far left and then add a POP with a sprinkle of the magenta or the mustard! 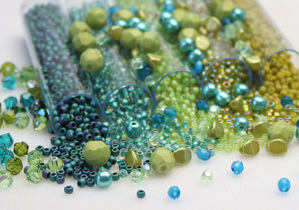 You can pick and choose from this palette and end up with a fun vibrant color combination for any beading project. If you like any of these colors I linked above to specific products, but the actual product isn’t quite right for the project you have in mind, consider using our website’s search feature and searching the COLOR NAMES of the items above and you’ll get plenty more options in the same palette! Example – You haven’t worked with Rivolis yet but you love that Amethyst color and want something that has a hole – check out this Amethyst search result! Or if you’re loving that Druk bead (#7) and want to see what other options we have in the same color, check out this Shaded Spruce Saturated Metallic search result! Consider experimenting with them (and other jewel tones) in your next project! Bead on, Ladies & Gentlemen! Next Post Leah’s Must-Have picks for Every Bead Stash!